Original 2002 24 Hours of Le Mans Poster. June 15 & 16, 2002. 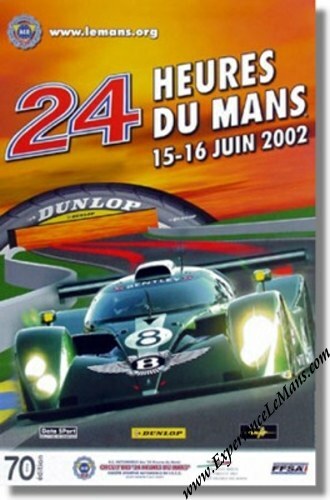 The 2002 Le Mans poster is part of the era in Le Mans posters which is generally described as "The Le Mans Poster in the era of computer graphics and sponsorship" and which lasts from 2001 until the current day. The 2002 24 Heures du Mans poster was produced by the Archimede agency after a color illustration. Bentley is the star on this poster which also highlights the new section of the circuit that replaces the former straight on the run-down to the Tertre Rouge Esses. The race was won by Frank Biela, Emanuele Pirro and Tom Kristensen in their # 8 Audi R8 with a total of 375 laps to their name. For the full results of this race, please see 24 Heures du Mans results 2002. Only a few available !